Dreams can come true. In the cold winter months, perhaps the most satisfying dish to be had in Japan is ramen. With almost 9,000 ramen shops in Tokyo, it is not hard to find one, but rare is the one where the noodles are handmade from scratch and where the chef is a graduate of the Culinary Institute of America. Ivan Orkin, a native New Yorker, honed his culinary skills with some of America’s top chefs, including Andre Soltner who founded Lutece and celebrity chef Bobby Flay of Bolo, both famed New York restaurants. With an impressive resume like this, one has high expectations and Ivan does not disappoint. Before opening his ten-seat ramen shop Ivan ate his way through hundreds of bowls of ramen, taking careful note along the way. 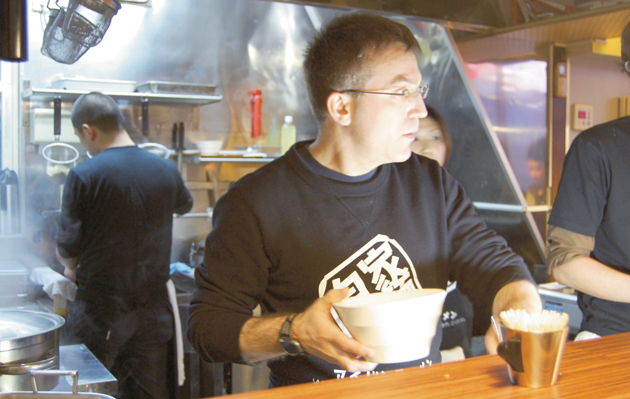 Ivan Ramen opened in 2007 and ramen junkies touted his shio (salt) ramen. 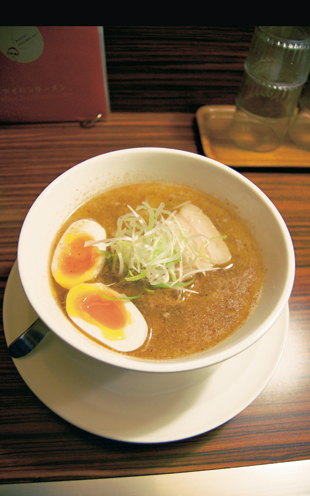 Soon thereafter bloggers touted his shoyu (soy sauce) ramen. And, recently, after participating in a tsukemen event with the city’s top ramen chefs, diners are coming in asking for the noodles to be dipped in broth. Ivan also serves a unique mazemen with a base of soy milk, slow-roasted vegetables including tomatoes and garlic with chicken soup that is served with whole wheat noodles. His standard ramen noodles are made on the second floor of the shop along with some non-traditional flour, as well as whole-wheat, and rye noodles. Ivan’s basic stock in his restaurant is made from chicken stock and a rich, fish-based dashi made from kelp, bonito, and dried sardines. Aside from the fact that Ivan is the first Westerner to break the ramen glass ceiling in Japan, his restaurant stands apart from the others as it is brightly-lit, family-friendly, and boasts some menu items that stray from your typical noodle shop. The slow-cooked pork and roasted tomatoes over rice will have you swooning and for those with a sweet tooth, Ivan makes ice cream. Sunkus, the convenience store, has sold instant ramen made by Ivan, selling 600,000 bowls, as well as his original onigiri and pork bowls. As of this writing, Ivan was serving up a limited edition Mexican mazemen of noodles topped with black bean chili, onions, guajillo chilis, dried tomatoes, lettuce, Monterey jack cheese, with a chipotle chili broth. A great combination of flavors found in his native America and his new home, Japan. The ever-curious chef is constantly tweaking his art through reading cookbooks, and challenging himself with new gentei (limited edition) noodles. A bowl of Ivan’s ramen will open your mind to the possibilities that exist with ramen. He brings a unique perspective and culinary skills to the world of ramen. We, the diners, reap the rewards of his creativity and constant honing of his art. Since then Ivan has opened his second ramen shop, Ivan Ramen Plus. Check out his website above for more deatils. Ivan also answered questions for us here. Ivan’s newest shop is reviewed here by Robbie Swinnerton in The Japan Times.